Following Christ. What's it all about? Comprehensive training material and advice for leading a Discipleship Explored course. Please note there is a newer version of this title. Discipleship Explored is for anyone who wants to make the most of their Christian lives, but especially for people who have recently completed an evangelistic course and decided to follow Christ. This comprehensive leader's guide contains everything you need to run the course, as well as the questions from the participant's Handbook, complete with answers! 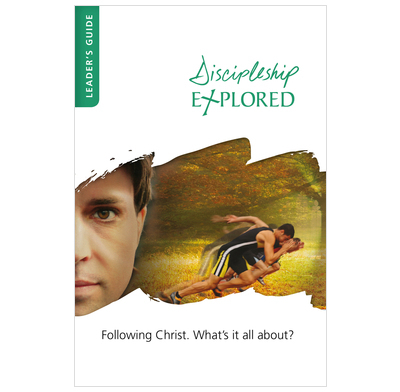 Discipleship Explored has always been a valuable tool for helping Christians understand what it means to follow Christ. But with this new series of films, along with the accompanying leader’s and guest Handbooks, it reaches another level of excellence. The films are a pleasure to watch; Thabiti Anyabwile conveys the meaning of Philippians as he reads it for us, section by section; and Barry Cooper excels as an engaging guide to help us understand Paul’s Letter to the Philippians and apply it to our lives today. And all this comes with a wonderfully international flavour to both the locations used and the Christians who make cameo appearances. If, after using Discipleship Explored, you don’t love Philippians and want to grow more like Christ, you may be spiritually brain dead. The only downside is that it may make you impatient for this team to do the rest of the New Testament! We are using Discipleship Explored with a group of International University Students. We are being challenged and humbled by this study in the book of Philippians. The videos are easy to follow and effectively highlighted the key ideas that are presented in this course. Thank you for creating this resource. I have just come back to God after an absence of 30 years and was asked if I wanted to do the Christianity Explored course. I agreed, but it was a very small group of 3 in total. I found it to be a very informative and soul seeking course. It gave me a lot to think about as I have a terminal heart problem, and most of the time I cannot attend worship because of this, so it was based at my house and the course had to go along at my pace. We finished the course and I and the other person thought it was really good. Having enjoyed the experience of the course, I wanted to do the Discipleship course, but the other people could not because of other ministerial duties and holidays, so I decided to start it myself. I am finding it difficult and challenging at times, but with continues prayer and guidance from Jesus I am coping. I find at times that I cannot come up with the answer straight away so I put the book back down, put the DVD back on, watch the session again, again if necessary, and I go to my quiet place and pray for understanding, then go back to it, and that works for me. I am half way through session 6, their is more thought required for this as I do not have the chance of discussion with anybody and I am finding it more soul searching than before. If you want to get in touch with me in a few weeks time, when I have completed the course, I don't mind. I hope that this might give someone encouragement to do a couse like this, as I said it had been 30 years since I had even set foot in a church and to go through Christianity Explored gave me a wonderful foundation. Thank You for that. The Discipleship Explored is giving me love, hope and encouragement for me to go on in life, and for the strength to live beyond death, to a new inspired life, a life that is full of His Grace and Mercy. It's been a while since we ran a Discipleship Explored course, so we embarked on this one with some trepidation. Some felt the course material would be too dense and challenging for new believers, while others felt it misses some of the basics of the faith that might seem appropriate in a Discipleship course for new converts. In the event, we have enjoyed the course immensely and our mixed group has loved using the text of Philippians to get to grips with what it means to be a disciple of Jesus Christ. I think the secret is to use the course material as a basic framework and be prepared to be flexible and adapt it to the needs of the group as these emerge. So for instance, we spent a lot of time discussing the nature and work of the Holy Spirit following the homework in week three and also discussed the nature of the Church as part of our discussions on unity in Chapter 2. So it is possible to cover some additional topics not explicitly covered by a study of Philippians whilst benefiting from a greater understanding of what it means to be 'in Christ' and from studying the inspired text. It does still feel a bit complicated and confusing to participants and at times the material seems a bit repetitive, especially when the group are keen to ask questions on all aspects of the Christian faith. My current group has mostly new believers, with a couple of more mature Christians so the difficulty is that the new comers want to know more about Church, the Sacraments, prayer, witnessing, morality and so on and these and many other questions have to be woven into an already dense programme of study. Some of the questions are irritatingly obvious comprehension questions but in fairness, these are mixed in well with questions that prompt group discussion and a common understanding. We haven't quite finished the course but have loved doing it so far and have no doubt it will bear fruit in all our lives. We have run a small group using the discipleship explored material, it has been of great benefit to those attending and we have all enjoyed working through the weekly material. We would thoroughly recommend it. Excellent material, well presented by Barry Cooper. Clear and concise outline and workbooks presented in an understanding format. Very practical course for every day Christian living as a disciple of Christ Jesus our Lord. Very interactive and encouraging study on Philippians. Group members have been doing the daily devotions and say it's the best part about the study. Everyone looks forward to the next study. You have done a fantastic job all round. Order delivered promptly. Have watched Dvd and correlated to the handbooks and especially helpful was the Leaders handbook. We plan to use this with a mans group and sowing the seed of God's word in hearts and mind. Pray for the fruit that will follow. God's word will not return to Him void. The perfect follow on study for our Ladies Christianity explored course. Have had good in depth discussion. The leaders guide gives helpful answers to direct the conversations. Along with the dvd we are growing together in our faith and walk with God. This course was originally used as a Bible Study at Church.It was very thought provoking, and hard hitting, but was very necessary. Unfortunately it has been forgotten by the majority of those who attended, I say with regret. I purchased the dvd for future reference for myself and wife, and as a reminder to those who completed the course, and those who did not see it through. A very worthy addition to our library.